Brooklynn Bunny was born with a twisted paw. Her big brothers wonder how she will be able to hop properly, but their Mama reassures them that Brooklynn’s paw can be corrected. The family doctor puts her paws into casts which straighten them over time. Brooklynn is able to choose a pair of ‘special boots’ (a brace) to wear at night to make sure her paws stay straight. 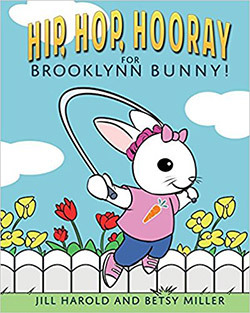 The determined little rabbit is very keen to learn to hop with a rope so she can take part in the Hippity Hop Games. Eventually her hard work and persistence pay off, and she is able to take part in the race and have lots of fun in the process. A lovely inspiring story. Children who have been through treatment for clubfoot should recognise something of their own experiences in this book. It provides clarification for their siblings and friends too, who may be curious about the condition. The illustrations show little delicacy and skill, although the colourful comic book style is likely to appeal to young children. Young siblings and friends may be worried about a child with clubfoot and may need explanation and reassurance. It can be hard work to keep practising new skills and exercises, but with determination you can get there. Casts and braces may have to be worn for some time; change does not happen overnight. Lots of medical visits may be involved. Brooklynn shows persistence and positivity. She doesn’t give up when she realises that learning to hop with a rope won’t be easy and will take time. Brooklynn’s hard work and determination pay off and she is able to hop with a rope at the games. There is a letter for children at the back of the book explaining that the story is based on a real girl called Brooklynn and her family. It encourages the reader to keep trying to accomplish anything. There are also some tips included from the author for parents of children who wear a brace. Make a medal or a trophy for Brooklynn to recognise her hard work and achievement. If you could customise your own ‘Superboots’, what would they look like? What new skills have you found difficult at first? How did you finally master them?